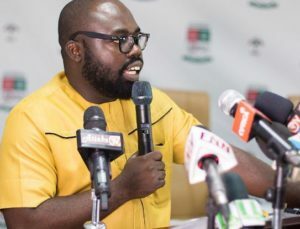 A Deputy General Secretary of the main opposition National Democratic Congress (NDC), Peter Boamah Otokunor, has described President Nana Akufo-Addo as a “dilapidated and astronomically depreciated president”. Reacting to the press conference addressed by John Boadu, General Secretary of the New Patriotic Party (NPP) on Sunday, where Mr John Dramani Mahama, was described as a redenominated candidate, Mr Otokunor said it would be proper for Ghanaians to vote for a redenominated candidate than vote for a dilapidated and astronomically depreciated president. He slammed John Boadu over the press conference, which he posited was used to peddle lies. Ghanaians he said are suffering under the NPP with unprecedented job loses and incompetence in the highest level, despite assurances given by the ruling NPP. John Boadu on Sunday, admonished Ghanaians to reject Mr Mahama because he has nothing new to offer Ghanaians other than the incompetence and corruption Ghanaians witnessed under his tenure. He posited that the NPP has performed better than the NDC under the fourth republic when it comes to the economy. But Mr Otukonor says Mr Boadu failed to recognize that it was under Mahama as chairperson of the Economic Management Team (EMT) that Ghana got a rating of B+. To him, the 2020 general elections would be based on the record of Mr John Dramani Mahama and that of Mr Akufo-Addo. ‘’Mr Mahama stands tall when it comes to the record between him and the incompetent Nana Addo. Nana Addo’s record will make him a dwarf before Mahama because he [Mahama] stands tall. Ghanaians are suffering. They will assess and evaluate their living condition to decide who to vote for in 2020. But I can assure you that Ghanaians will vote for Mahama because they know what he has done for them. The hospitals he constructed and other infrastructural projects he embarked on, are all there for people to see,’’ he said.